As a beauty blogger, I receive TONS of emails to try new brands -- especially skincare products. Recently, I was given the opportunity to try nyakio™, a skincare brand that I learned is under parent company, Sundial Brands (i.e. Shea Moisture, Madame CJ Walker Beauty, Nubian Heritage). The brand is founded by a woman of color, Nyakio Kamoche Grieco (first-generation American of Kenyan descent). A large percentage of my readers/followers are black women like myself, so I always love when I can support a sista. nyakio™ is available exclusively in Ulta stores and online -- something I didn't even know and I spend a lot of time wandering the store looking for new things to try! I appreciated the brand's focus ethically and sustainably sourced indigenous ingredients (I'm all about what's in my products) as well as philanthropy through non-profit organization, Girls Inc. I love a good melting cleanser/balm. A few that I've tried are: YesTo Coconut Melting Cleanser, Colleen Rothschild Radiant Cleansing Balm and EVE LOM Cleanser. However, none of those are quite like the nyakio™ Sweet Almond Cleansing Oil Balm. When I first opened the jar, I noticed the rose color and slight glowing shimmer in the light. It was gorgeous, yall! Plus, I love pink. How To Use: The texture was smooth, simple to scoop and quickly melted from balm to oil from the warm touch of my fingertips. A small amount goes a long way with this balm. I massaged the Cleansing Oil Balm on my skin in tiny circles for approximately two minutes before placing a warm washcloth over my face and wiping away. You can also use tissue to remove, but I prefer a regular washcloth or muslin cloth. The Results: After removing the balm, my skin felt baby soft and smooth from the nourishing sweet almond oils sourced from Spain. It is extremely conditioning! I didn't have makeup on the first time I used it, but these types of formulas are usually excellent for breaking down makeup and the Sweet Almond Cleansing Oil Balm is one of them. Exfoliating a few times a week is über important! I'd say two to three times depending on your skin is sufficient. I've been on the hunt for new exfoliating treatments to try out and this one combines antioxidant-rich Kenyan coffee beans, jojoba oil and shea butter. Initially, I assumed the formula would be a bit rougher, but it's actually quite gentle and creamy to have coffee grounds blended in it. It also doesn't have a strong coffee scent as I expected which wasn't exactly a negative thing whatsoever. How To Use: Be sure to shake the Kenyan Coffee Face Polish before using it! When I squeezed my first bit out, it seemed that there was a little bit of settling or separation while it was in transit causing a runnier consistency -- nothing a quick shake couldn't fix. A quarter size of this exfoliator was just enough for a light layer over my entire face. I massaged in small circles and really focused on my nose, cheeks and forehead because those are the areas that tend to become the roughest and produce the most oil. After a few minutes, I rinsed the Kenyan Coffee Face Polish with a warm washcloth. The Results: Upon rinsing, I noticed a difference in my nose. No more roughness due to daily impurities, so it definitely did the job! No matter whether you have dry, combination, sensitive or oily skin, moisturizing is a step that none of us should skip. 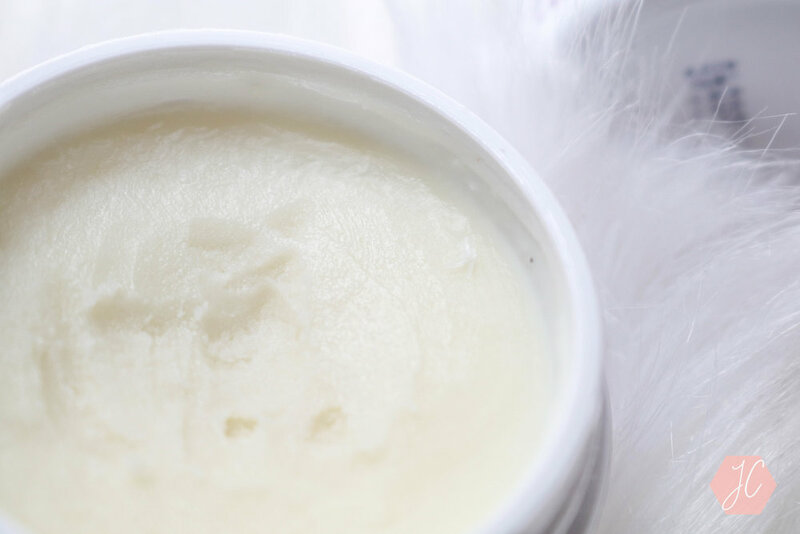 Since it's summer, my Tamanu Firming Face Balm was melted upon arrival; however, I always pop my completely melted products in the fridge or freezer for about 30 minutes or until solid again. This will help the product return to its natural smooth texture rather than crystalize and get lumpy. How To Use: While the packaging states this moisturizer can be used for day and night, I recommend it for night if following an oil or serum. Whenever I did use it in the morning, I skipped my serums and oils so my face wouldn't be too oily and I could jump into makeup without having to wait for my skin to absorb all of the product I'd applied. For this balm formula, remember that a little bit goes a long way! 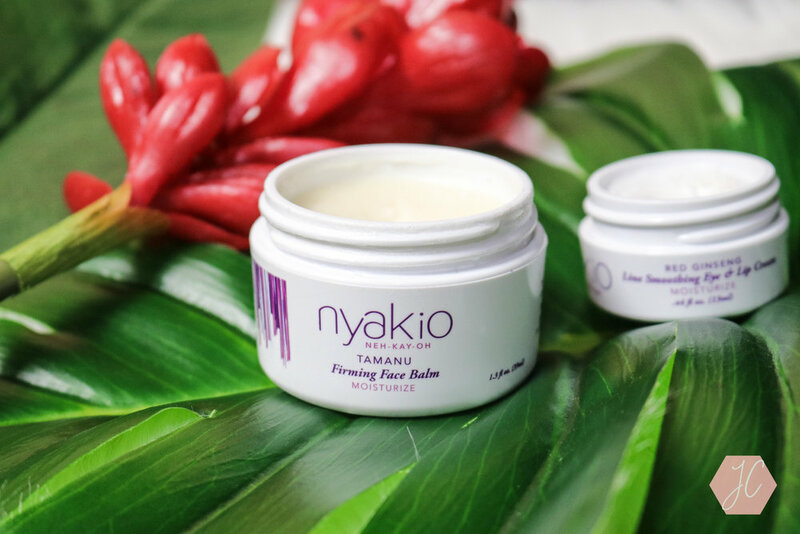 The Results: The nyakio™ Tamanu Firming Face Balm's consistency reminded me of shea butter, but with tons of extra beneficial ingredients. Actually, shea butter is the very first ingredient of this balm, so it really provided and locked in all of the moisture. It's pretty intense unlike some formulas that are more water-based. Provided a tiny amount is applied, it can definitely be used prior to makeup. I though the Red Ginseng Line Smoothing Eye & Lip Cream would be really cool to try because I've never seen a cream for both the eyes and lips. I don't really have lines or wrinkles in those areas, but it's never too early for anti-aging products, so I'm always down to use a good cream to help prevent or reduce those things especially with the benefits of red ginseng. How To Use: This works just like any eye cream where you press into the skin under and around the eyes, but it can also be use around the mouth area as well. The Results: I can't say I noticed a difference or improvements for lines because I don't have any but, as I mentioned, I still use eye creams. Since I'm always using refrigerated masks to reduce puffiness in the morning because of tiredness or allergies, I'd like to try the Quinoa De-Puffing & Firming Eye Cream and see how that actually works for me. I will say that I can feel that it's hydrating which is huge plus because when allergies/itchy eyes kick in, the constant rubbing can cause dryness and the skin around our eyes is already very delicate. 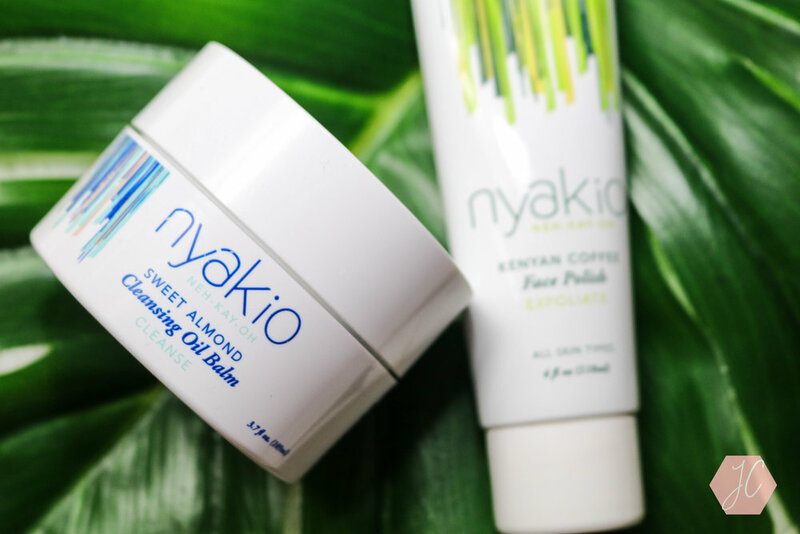 Have you tried nyakio™ skincare products from Ulta before?